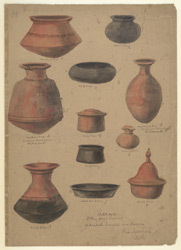 Watercolour by Philip Meadows Taylor (1808-1876) of red and black ware pottery from cairn circle graves at Chikanhalli, Jivarji and Andola in the Gulbarga district of Karnataka, dated 1851. The image is inscribed on the front in ink: 'Pottery from Cairns. Chikunhulli, Jewargi and Andola. Meadows Taylor delt. Sketch No. 10.' All of these eleven objects are reproduced in Taylor's 'Descriptions of Cairns, Cromlechs, Kistvaens and other Celtic, Druidical or Scythian monuments in the Dekhan' (Dublin, 1865). Objects Nos. 8, 10 and 11 are reproduced together with the caption: 'Chickunhulli Cairns. Large Urns, containing human ashes and charcoal'. These are all over three feet high and between one foot nine inches and two feet three inches in diameter. The remaining images are reproduced together at a quarter their original size, 1,2,3 and 9 from cairn excavations at Jivarji and 4,5,6 and 7 from cairns at Andola Taylor wrote, "The vases or pots found in these cairns...had been placed, some at the head of the bodies behind the cists, others upon shelves left in the shale. They were red and black earthenware, covered with a rough vitreous glaze."